Groundbreaking (well sky-breaking) astrophysicist Vera Rubin died Sunday, December 25, 2016. She was 88. Rubin confirmed the existence of dark matter which comprises 27% if the matter in the universe. What it is exactly remains a puzzle. I have written about comments made by cosmologist Sabine Hossenfelder on how deserving Dr. Rubin was of the Nobel Prize. NPR's Camila Domonoski wrote a lovely summary of her life and also a tribute yesterday. Domonoski includes a widely cited quote stating Rubin's assumptions about life and work. I think these may be from a Carnegie Institution celebration of her life and work in 2002. 1) There is no problem in science that can be solved by a man that cannot be solved by a woman. 2) Worldwide, half of all brains are in women. 3) We all need permission to do science, but, for reasons that are deeply ingrained in history, this permission is more often given to men than to women. 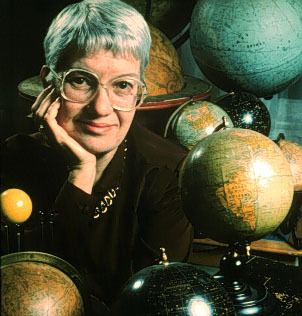 Vera Rubin was a national treasure. The commencement address Rubin delivered at the University of California, Berkeley, May 17, 1996 was chosen by NPR to be included in a list of the 100 best commencement speeches ever. It is one of those addresses that you wish you attended.